Along with the establishment of the Graduate School of Integrated Sciences for Global Society (ISGS), Kyushu University, the Global Training Project for Integrated Academic Education was launched, in order to promote “globalized education", and "advanced interdisciplinary education". The previous Graduate School of Social and Cultural Studies of Kyushu University pursued interdisciplinary research and education for the past 20 years. The enrollment ratio of international students exceeded 50% and the completion rate of the doctoral course was 90%. In April 2014, a newly renamed department, the “Graduate School of Integrated Science for Global Society”, was established as part of the restructuring of the Graduate School of Social and Cultural Studies. The aim of the new graduate school is to foster the development of professionals who are better equipped to solve global challenges. In addition, the Leading Program was launched to produce graduates with the skills and innovative capabilities that will enable them to lead Asia forward in the near future. The "Advanced Global Training Project for Integrated Academic Education” was thus established to advance the internationalization of their education and to promote interdisciplinary education. Training high-level global professionals through an integrated interdisciplinary education. Constructing an advanced global interdisciplinary educational network. For more information about these initiatives, please click here. ○ Establishing global networks in academic education through the strengthening of cooperation with overseas research institutions and conducting research overseas. To achieve our goals the Project Steering Committee, the Global Project Office and the Project Evaluation Committee have been established. Moreover, the Project Implementation Group, which comprises members of faculty of overseas collaborating institutions and the graduate school, will work with these committees and offices in the promotion of an integrated interdisciplinary education that aims to solve global issues. This project works with overseas and domestic research institutions to build global educational networks. Currently, over 20 overseas educational institutions have agreed to collaborate in this project. 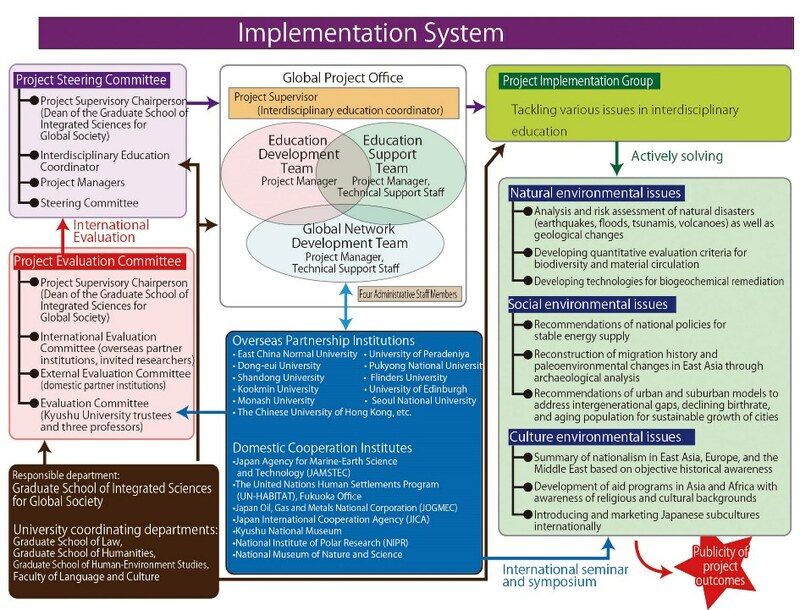 The project collaborates with various organizations in Japan. In the future, we plan to expand the collaborations with local governments and companies, NGOs and NPOs in the Fukuoka area. Fukuoka City has a proven record of hosting various international events related to Asia; therefore, students will be able to build relationships with Asia through these various avenues.